This Catalogue of the Craneflies of the World (CCW) covers all 18108 genus-group and species-group taxa of the families Pediciidae, Limoniidae, Cylindrotomidae, and Tipulidae (Insecta, Diptera, Tipuloidea). Its author is Pjotr Oosterbroek, staffmember of the former Zoological museum of the University of Amsterdam, associate staffmember of NCB-Naturalis, Leiden (see the Manual for contact information). Apart from the standard taxonomic information (family, subfamily, genus, subgenus, species, subspecies, author, year, publication, synonyms, original genus, original spelling), the catalogue includes up to date information on the distribution of the species by countries and, for the larger countries (e.g., USA, China), provinces, states, or islands. For almost all information that differs from what is found in the regional printed catalogues the reference is given. The CCW furthermore includes reference to all relevant information and figures published by C.P. Alexander and others (see the Manual). For a quick search, please go to the Search page and enter a scientific name or country to search for. For more search options, select Advanced search. In the search results, empty fields are not displayed. 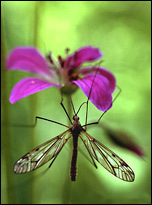 Relevant cranefly literature can be searched for under Literature. The Manual in detail explains the background of the CCW and lists the abbreviations used in the search results. Database information such as the number of taxa included per family and the last update is listed under Statistics. Illustrations at the species level (currently 11187 images of 2530 taxa).